Wall coverings (fancy term for wallpaper) are not as popular today as they have been in the past. Many people are opting for faux painting finishes instead of wallpaper. In our new home, we have no wall coverings at all, only paint. We chose to go with all paint., but including the trim colors, we have about 15 different paint colors. My recommended paint brand for interior paint is Valspar American Tradition. It is sold through Lowes Home Improvement Warehouse. Now, I know that doesn't sound good, but Valspar is rated number one by Consumer Reports for its combination of toughness (ability to handle rubbing), hiding (ability to cover underlying color), fading, mildew, and fumes. One great thing about Valspar American Tradition is that they have a great color selection, and all you have to do to find samples is go to a Lowes. We actually took home a sample of each color (several hundred). Valspar is not an expensive paint, but it is more expensive than the cheapest contractor grade paint that most painters use. They will whine about it, but just keep looking till you find a quality painter who will use it without charging you an arm and a leg. We chose to use eggshell as our standard finish in all rooms. It is tougher than a flat paint, just a little bit more shiny, and just a little bit more expensive. We used semi-gloss for our trim. This picture shows you both the cabinets and trim stained with whitewash, plus the 91-12c Woodlawn marmalade eggshell on the walls. 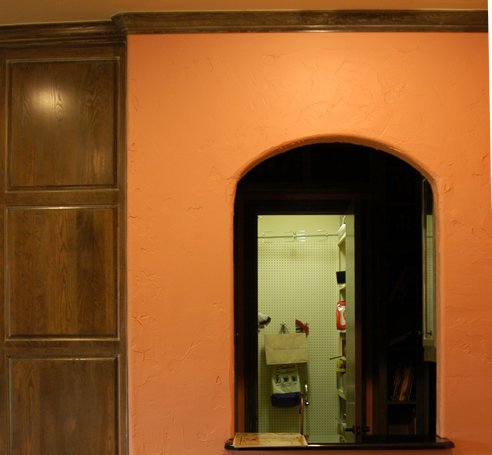 Like most wall colors, the marmalade looks totally different depending upon whether there is morning sun, evening sun, and room lighting.